I have been busy redoing the boys’ bedroom. 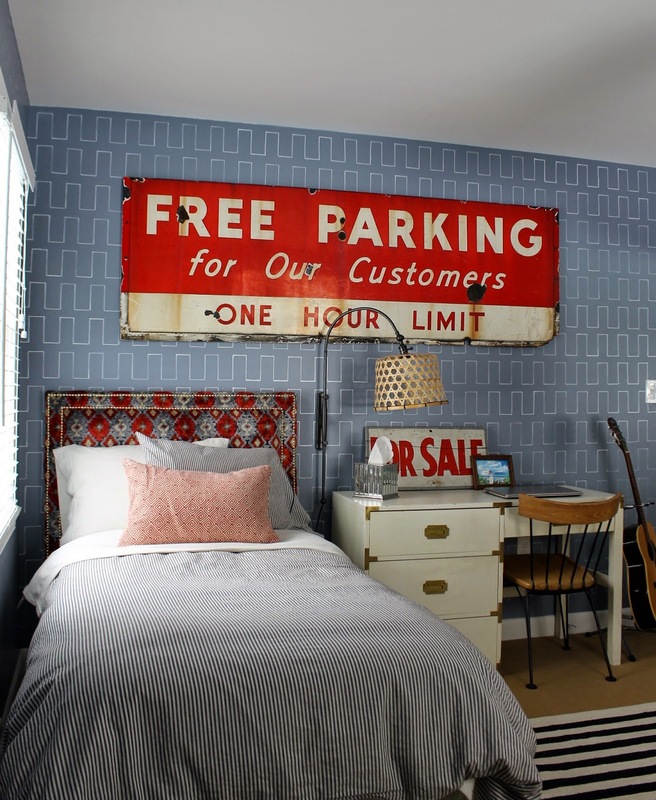 One of the biggest changes was getting rid of their old wooden beds and switching over to upholstered headboards. The old beds were very durable, but not that comfortable. I can’t tell you how many times they’ve banged their heads while rough housing. I was over the head injuries, and secretly I was looking forward to a soft place to rest my head during story time. I found the style I liked, a clean and simple rectangle with a double row of nailheads, but I was shocked by the price. The lowest I found was $299.00 for a twin size, and I needed two! This called for a DIY. 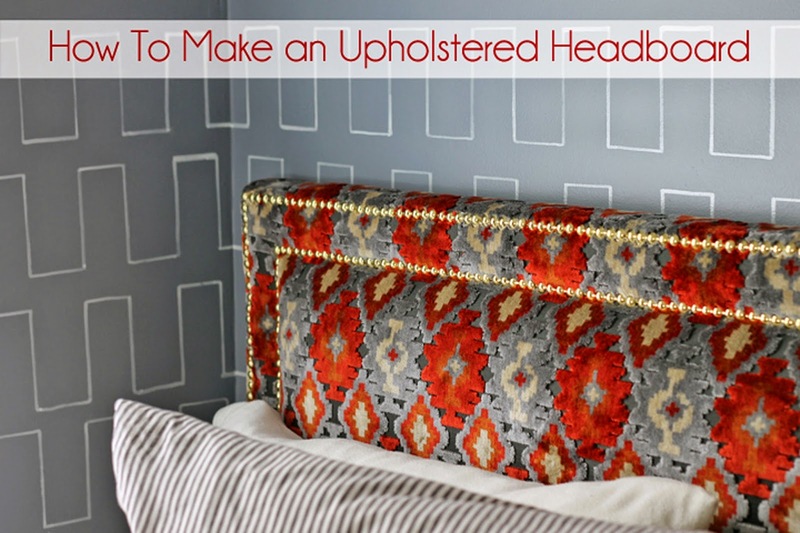 Making an upholstered headboard is so easy, especially this style. You will save hundreds by doing it yourself. As an added bonus you will get to pick your own fabric, so you will have unlimited options as opposed to having to select from what’s available online. I created a simple tutorial with materials that are easy to find. Almost everything below came from my local True Value Hardware or a fabric/craft store. I sized the project to fit 24” wide foam, a size that is readily available to purchase online and in craft stores. I also sized the twin and king sizes to fit 2’x3’ and 2’x 6’ pieces (also easy to find, no trimming required). You can use 2” or 3” thick foam, the choice is yours. I used 3” thick foam, which created a greater profile. The 2” thick foam will give a flatter look. 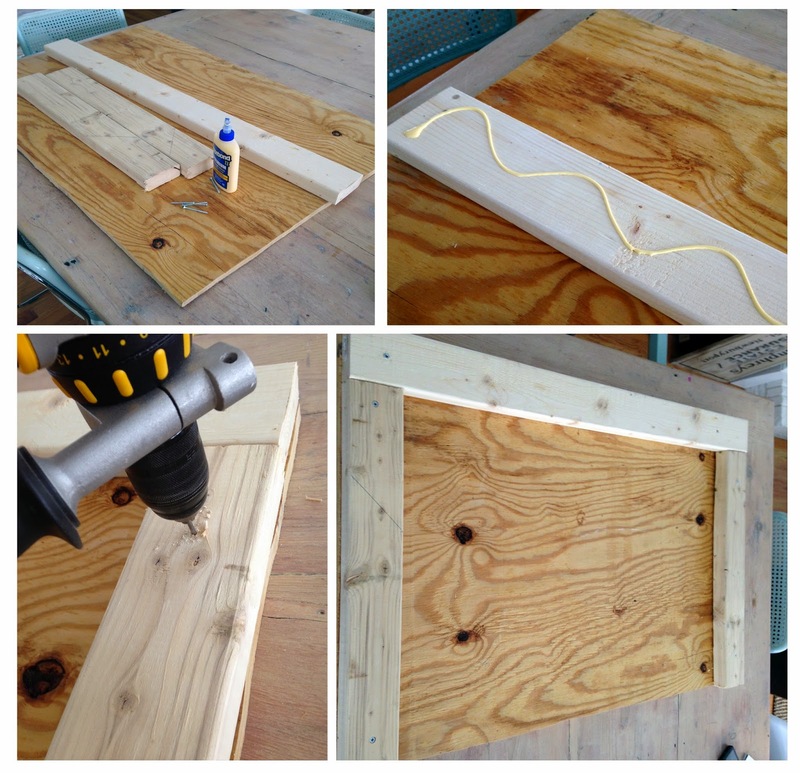 On a flat surface you are going to assemble your 3/4” plywood and 2x4 pieces to create a frame to hold your foam. 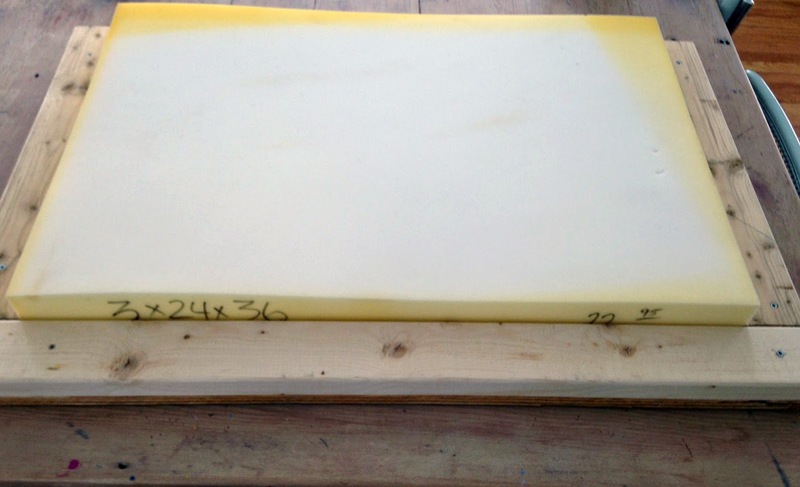 Apply wood glue to the back sides of the 2x4s. Arrange with the long 2x4 going across top and the two shorter 2x4s along the sides. The bottom remains open. Pre-drill two holes on the sides and three holes across the top. Using 2” screws, set the 2x4s in place with a drill. 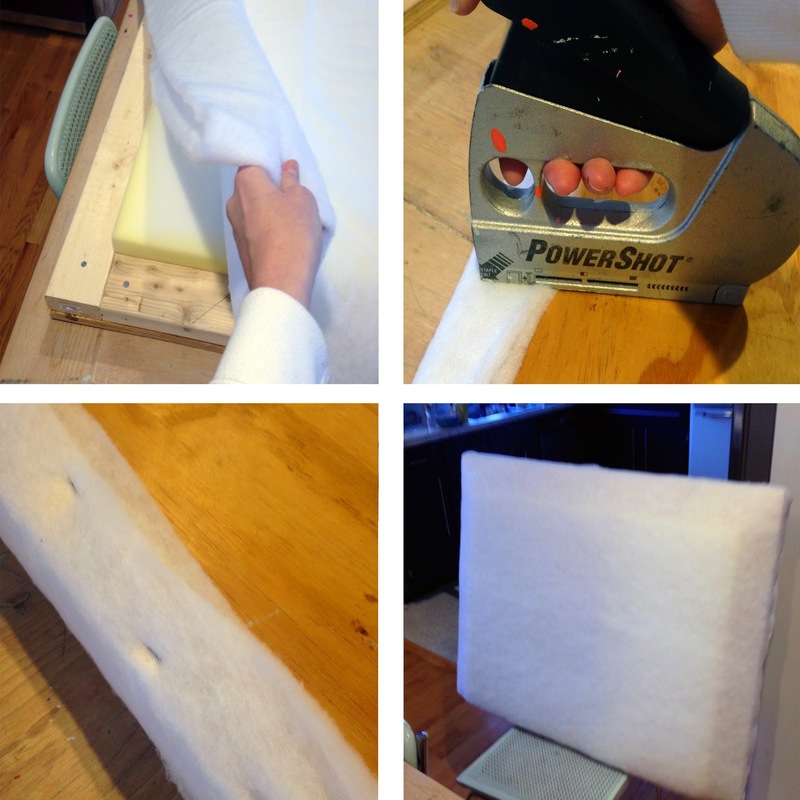 Spray the inside area of the headboard and the backside of your foam with spray adhesive. Press the foam into the framed area and let set a few minutes. Wrap the entire front of the headboard in batting. I used 2 layers of batting because I wanted a very plush headboard, but one will suffice. Batting is important because it will soften the 2x4s. Staple the batting along the backside edge of the headboard every couple inches being sure to smooth the front and gently pull as you go. Don't make the batting too tight… you want it smooth, but not “facelift” tight. You will be adding nail heads, so if using the 3” foam you’ll want a little give when you push down on the area over the 2x4s. Trim any excess batting from the back. You are now ready for fabric. Time for fabric. Be sure to use a suitable fabric, nothing too thin or flimsy. -Twin frames can handle 48+” wide upholstery fabrics vertically right off the bolt since they are so narrow, so no railroading is necessary. If your fabric pattern can be “railroaded,” run horizontally across the frame, you are all set. For full to king sizes you can easily railroad a solid, stripe or small patterned fabric so no seaming is necessary. If you chose a pattern that needs to go vertically, you will need to seam it together by sewing it to create a large width. -I like to find the center point of my fabric at the top and bottom. I cut a small notch in it to mark it. I then mark the center point of the top and bottom of my headboard with a permanent marker. When I begin to apply my fabric I simply line up the top mark with the top notch in my fabric and start stapling from this point. Next I smooth it down across the front and staple the bottom center at its respective marks. This guarantees a straight pattern layout. I then continue to smooth and staple the fabric to the backside of the headboard, stopping a few inches from the corners. Be sure to tug gently and pick up any slack as you go. -When you get to your corners, you want to make a neat fold to keep your edges clean. 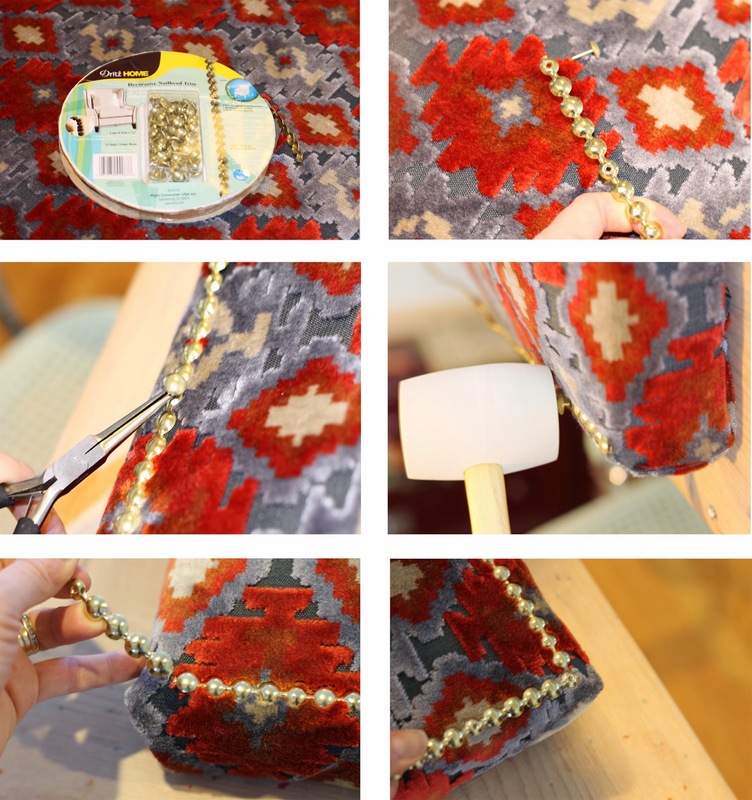 You can cut away excess fabric here before you tack it down to keep it from getting too bulky. Once you have stapled all four sides and corners flip the head board over onto its back. You are now going to apply the nailhead trim. 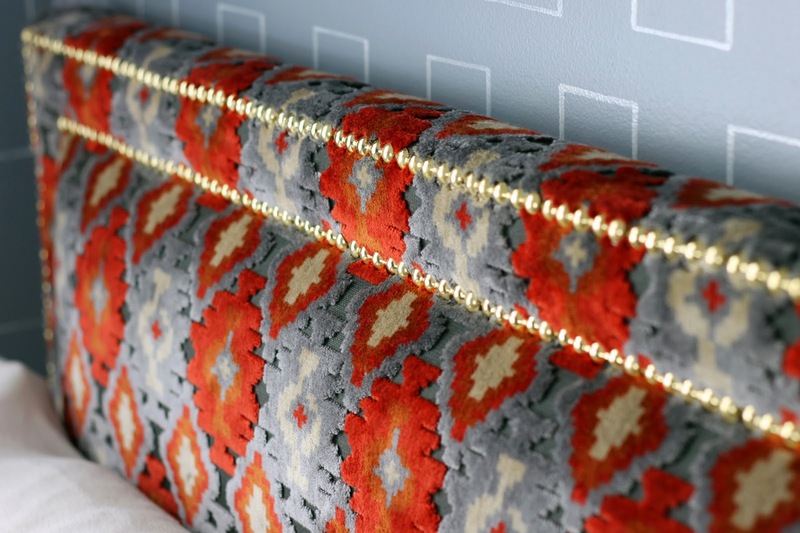 This trim comes as individual nailheads (single nails), or in connected rolls in 5 yards lengths. I prefer the look of individual nailheads, as there is no connection points visible like with the rolls of trim, but since I am going to be using 10 yards, that would take forever to do individually. Also, since I am using a velvet, the fabric’s plushness disguises the connections a bit. -The rolls of trim have a blank every 5 nailheads that requires you to nail through it to attach the trim. You will want to begin in a corner. 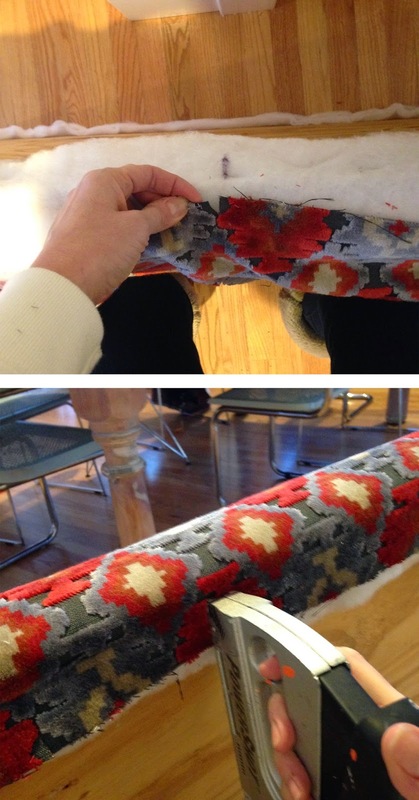 I like to unroll the trim and lay it out to make sure that I will have a blank pretty close to the opposite end. If not, I center the piece so I can add single nailheads to each side to balance it out. 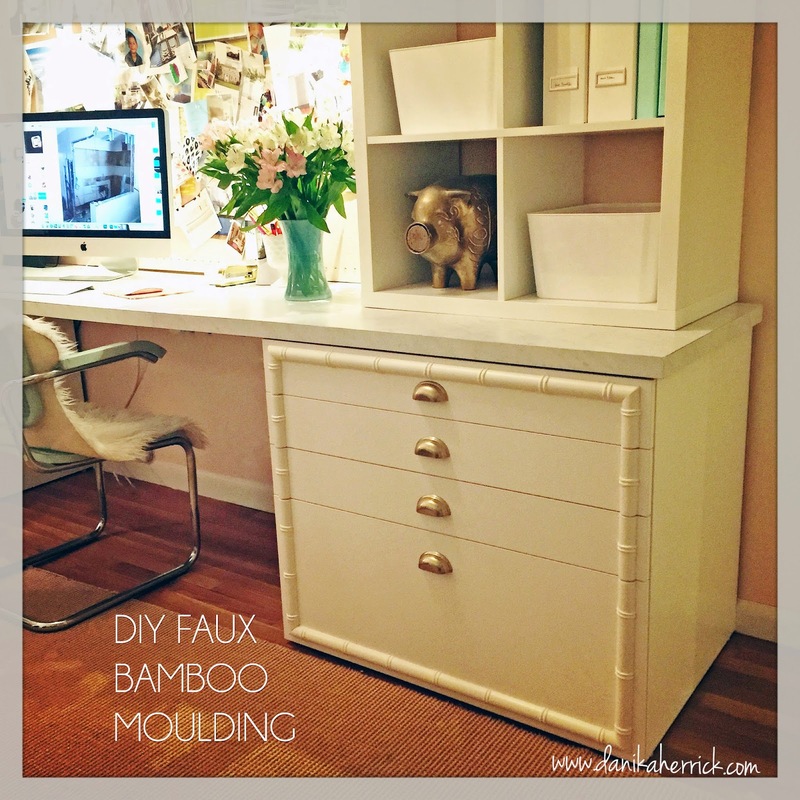 -Hold the nailhead trim with needle nose pliers and use a rubber mallet** to drive the nails in. Continue along the outside edge, straightening the trim as you go. When you reach a corner, finish on your last blank and then bend the nailhead back and forth until it breaks off. -Add single nails until you are close enough to the corner to start the perpendicular edge. Continue until the top and side edges are finished. Now for the second (inner) row, measure in about 3 inches and begin again. This time use your fingers to press and smooth the fabric towards the foam. Continue around until you have two complete rows. 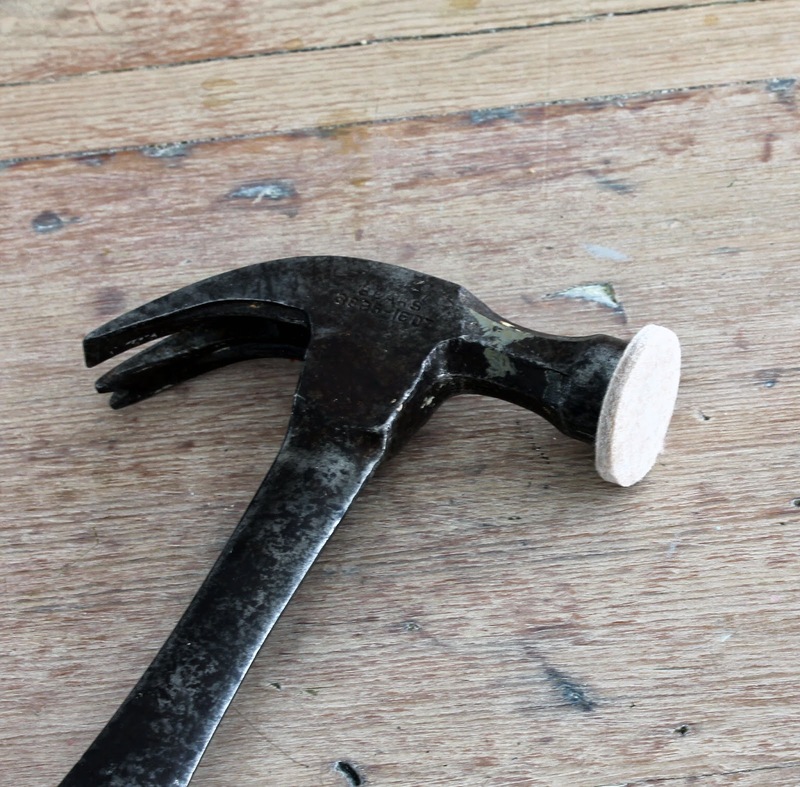 Stick a 1” round felt furniture pad to the tip of your hammer. It keeps the nailhead from getting scratched or dented and does the job! 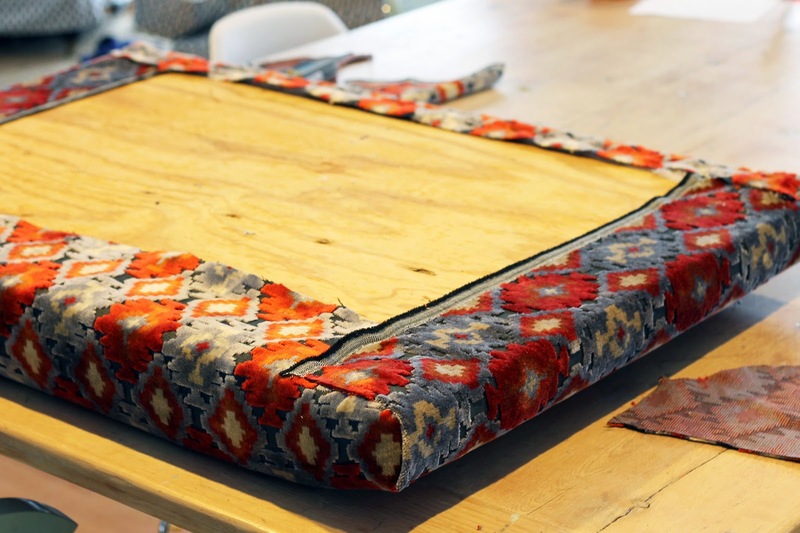 Your headboard should be looking good, and it is almost ready to hang. 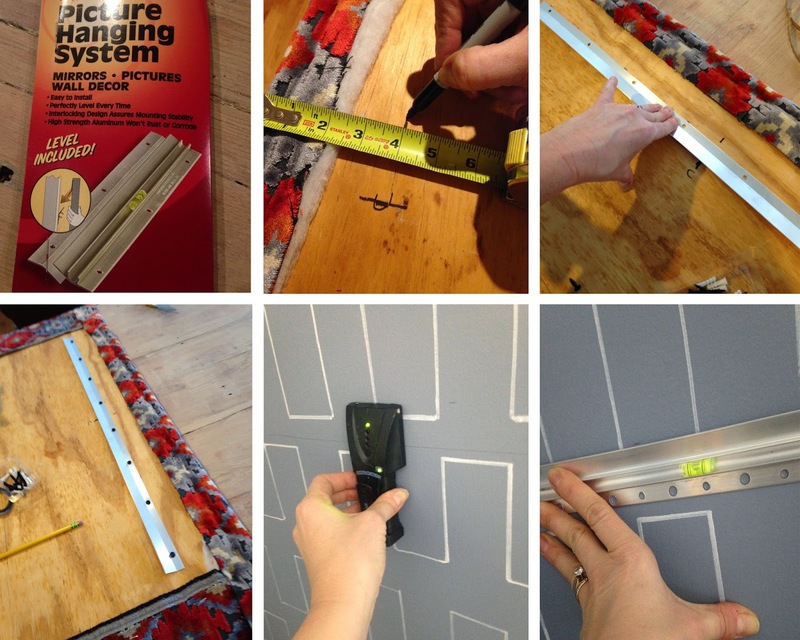 Using a heavy duty picture hanging cleat system, follow the instructions on the packaging to hang. I measured and marked 4” down from the top of my headboard in a few places and used this as my guide to attach the cleat to my headboard. I then determined where I wanted the height of my headboard over my bed and attached the other cleat to the wall. I used a stud finder and marked where to drill. I really loved how easy this system was to use. It even had a built in level! Once it was attached I simply slid the headboard down onto the cleat. It attached so easily and is very stable. I can’t tell you how excited I am by this project. It has totally transformed my boys’ room, and my youngest absolutely loves his new bed. Each headboard cost less than $100, and I even reused the plywood from their old bed’s platforms. And best of all this only took a few hours to do, so it is a great weekend project. Be sure to check out my past projects and more by visiting TrueValueProjects.com, as well as True Value on Facebook. Love this! Will you share where you got the fabric from? It's fab! I love the way this turned out and I love the fabric you chose soooo much! It's fabulous! I found the velvet at a local fabric shop, Zimman's in Lynn, MA. I'm not sure if they ship, but you could give them a try. This is gorgeous! 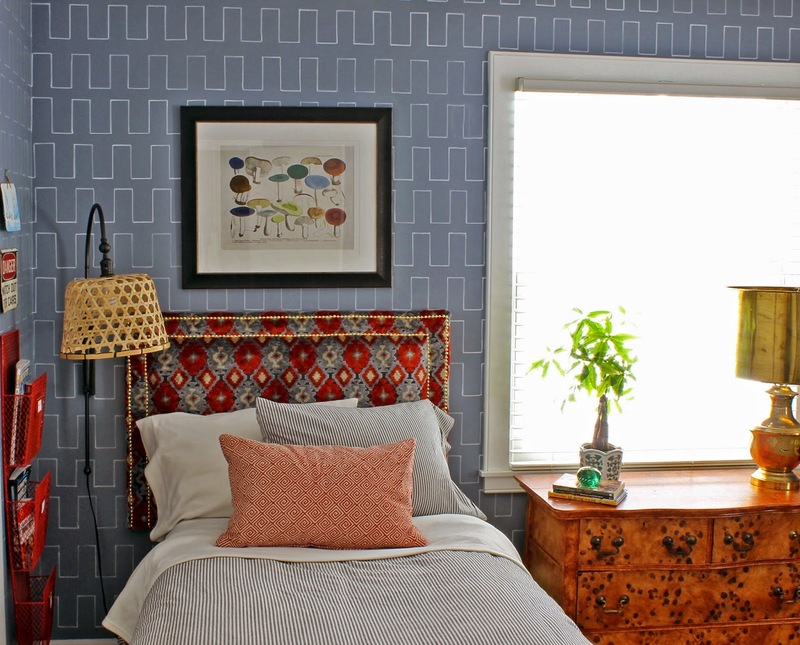 I love the fabric you used, the nailhead trim, the shape of it all - its just all beautiful! 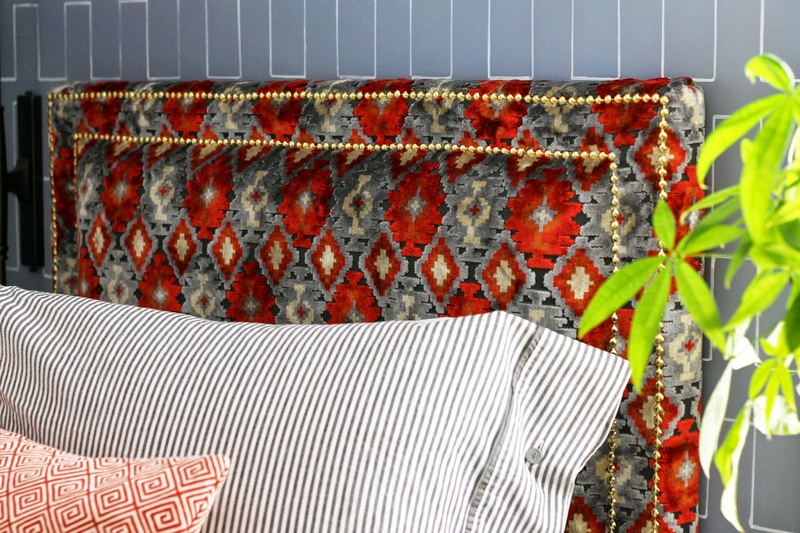 Oh my goodness, this is the most beautiful upholstered headboard I've ever seen! 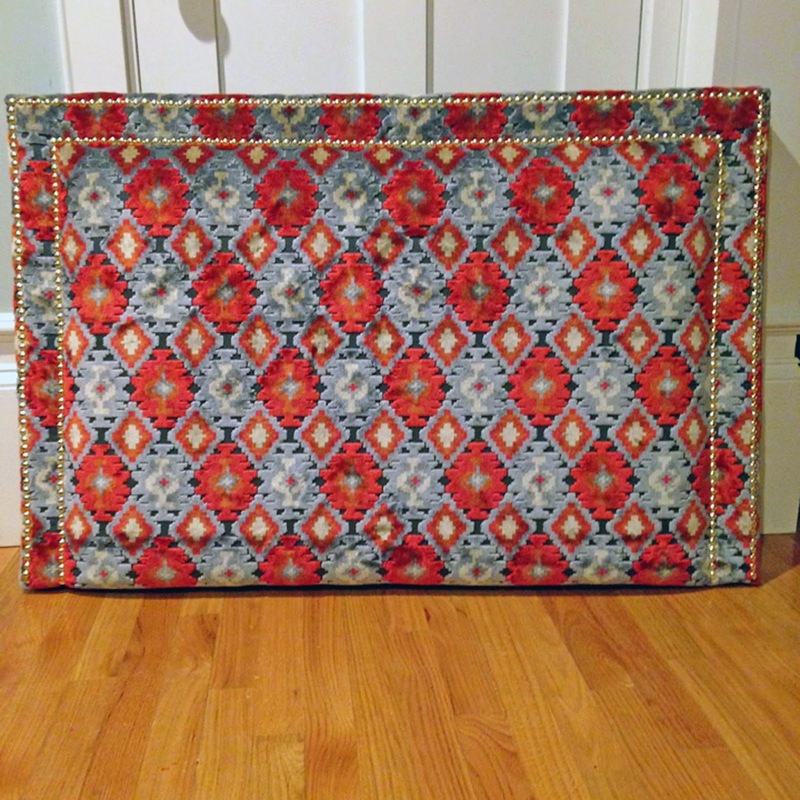 I've been doing research and looking into making a DIY upholstered padded headboard for months and yours is gorgeous! I've looked at so many! I wasn't sure what size or shape I wanted or wood trim etc. I knew I wanted velvet but that was about it. But yours is perfect! The rectangular shape is simple yet elegant and the double row of nailheads makes it stunning. Btw, your nailhead rows are perfect, I don't know how you did it! Thank you for the tutorial. I'm ready to give it a try. I'll let you know how it turns out!